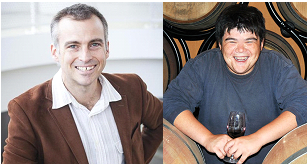 Damien Wilson (l) and Ryan O'Connell were among the speakers at this year's Wine Industry Expo. The 4th Annual North Coast Wine Industry Expo drew a record crowd to the Sonoma County Fairgrounds yesterday. Beyond the 600+ vendors filling the two largest buildings, the event featured a series of panels, beginning with an assessment of the State of the North Coast Wine Industry.